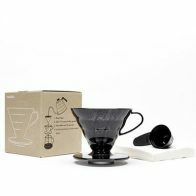 Quirky Coffee Company / Brewing Coffee / What is the difference between drip coffee and pour over coffee? 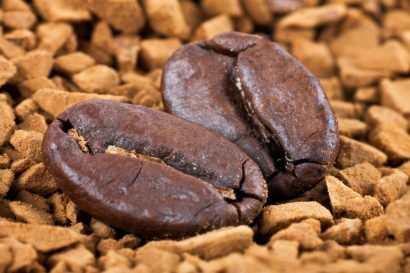 If you are looking to start changing the way you brew your cup of coffee then why not try one of these methods. Drip coffee and pour over coffee both produce a delicious cup of coffee if care is taken when brewing however there is a little more practice to be had for pour over opposed to drip coffee. Some patience is required to getting it ‘just right’. So why is one different to the other? They both have water poured over the coffee grounds, they both let gravity pull the brewed coffee down into your cup and they both make a clean cup of coffee – Correct! We shall explain further. 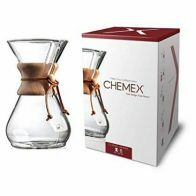 Ensuring you have quality artisan coffee beans which are ground to the correct size the pour over method and drip method both will create great caffeine enjoyment. 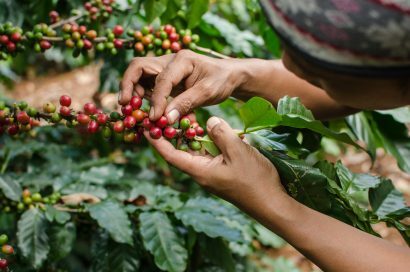 Is the quality of the beans and the precision of the grind enough? No, is the answer. Drip coffee machines can range in price, cheap and it won’t last and will produce an ‘ok’ cup of coffee. An expensive piece of kit would be an indulgent purchase but it will indeed bring you closer to heaven in a cup. However, pour over infrastructure will be far less costly and you control the results. Drip coffee machines control the brew for you whereas, pour over is all in your hands. Drip coffee will be quicker if you need that morning fix sooner rather than later but for a few extra minutes, you will not be disappointed with the results of the pour over method. Having the boiled kettle in your hand and slowly, and satisfyingly, pouring the water over your coffee grounds is far more rewarding! As we have just said the drip method gives you less control and this is also the case with the temperature of the water that dances with your coffee in the filter. Most of the drip brewers that we have tried and tested don’t quite hit the spot when it comes to the heat required. The temperature should be between 91 C (195 F) and 96 C (205 F). The closer to 96 C (205 F) the better. Boiling water (100 C – 212 F) should never be used, as it will burn the coffee. Water that is less than 91 C (195 F) will not extract properly. Pour over coffee allows you to control your water temperature to what is ideal and the control is all yours. Drip coffee machines are always going to be taking up more real estate in your kitchen. Pour over equipment, on the other hand, is small and neat that can be put away in your cupboard, and for the price, you can have more than one to play around with. We are big fans of the Hario V60 and the Chemex. The results, once some practice and time are given to the techniques, is out of this world. It does all boil back to one thing – QUALITY BEANS and GREAT GRIND. We know this feeling and we all have days when we need the coffee in our hand as soon as possible. For those type of mornings (or evenings) then drip coffee is going to be your friend. Your coffee routine will be smoother as you will not have to take the time to stand and pour water over the ground coffee yourself and of course, some drip coffee machines have a timer so your brew could be ready for you as you first stumble into the kitchen trying to wake up. If you are willing to spend extra, some drip coffee machines allow you to put whole beans into a hopper, they are then ground for you. Just set your timer and you will be ready to go. 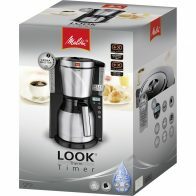 If you are on a budget we would recommend the Melitta Look IV Therm Timer with an insulated jug. Some drip coffee machines have a hot plate underneath the jug – we would not recommend this. The hot plate will keep your coffee warm however, in our opinion this then stews the coffee that you have brewed. The option of an insulated jug is a far better alternative. Some people report that pour over coffee is the best that they have ever had. We tend to agree with this. It gives you a crisp and clean tasting cup and most definitely gives you a much stronger and intense tasting flavour. All of the tasting notes of your chosen coffee will be jumping around in your mouth and it will certainly not be the same when you have to stop off and get a takeaway cup of fuel from your local coffee shop chain! So, you know the differences what now? Whether you use a drip coffee machine or the manual pour over method you will need to invest in some good quality coffee filters, and there are so many to choose from – not all good! 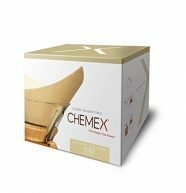 You can purchase standard white paper coffee filters if you like but they are bleached with chlorine and contain carcinogenic chemicals such as epichlorohydrin and dioxins. Dioxins are a byproduct of paper bleaching – I don’t think we need to say any more on this. It goes without saying that it is safer to stick to unbleached paper coffee filters or even better use a reusable coffee filter. We suggest perhaps purchasing a couple of the reusable filters so that one has time to be rinsed in water. 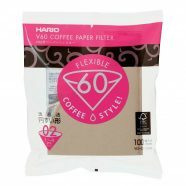 Do your research and check out the reviews of the coffee filters that you are purchasing. Drip coffee is great if you don’t have the time for the pour over method. If you are going to continue with the drip method then really try and invest in a good quality machine that will give you the years and friendship that you deserve. As with anything at some point a drip coffee machine will need replacing so buy with care and always read reviews. 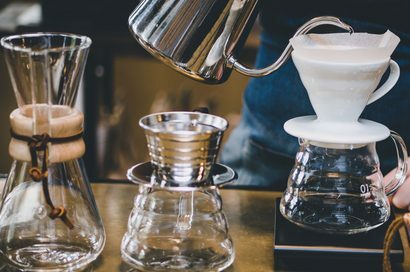 Pour over equipment, on the other hand, comes at a smaller cost and is made to last. A staple piece of kit to your kitchen cupboard. You can even buy one for the office and one for the home for less than a cheap drip coffee machine. A no brainer on the price comparisons! As with any type of brewing method whether it be the drip method, pour over, espresso, cafetière, Aeropress or just plain old simple instant coffee it will always boil down to what YOU ENJOY! 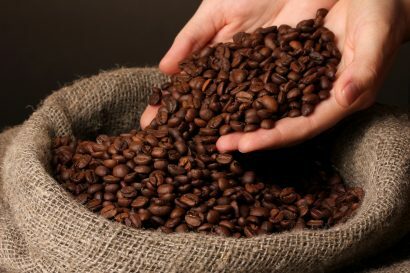 Check our range of fresh coffee beans here!